Saint Jude, cousin of Jesus, apostle and martyr; the Church honors and prays to you as the patron of hopeless cases and desperate situations. We ask you to intercede with God for our present needs. Come to my assistance in this great need, that I may receive the help of heaven in all my necessities, tribulations and sufferings: especially (make your request). If it is God’s will, pray that we may patiently accept our trials, disappointments and sufferings as a way of sharing in the sufferings of Christ. We trust that our prayers will be answered through your intercession. 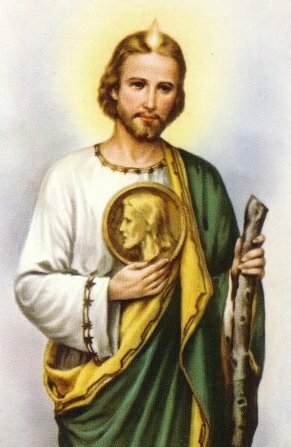 Saint Jude, pray for us.